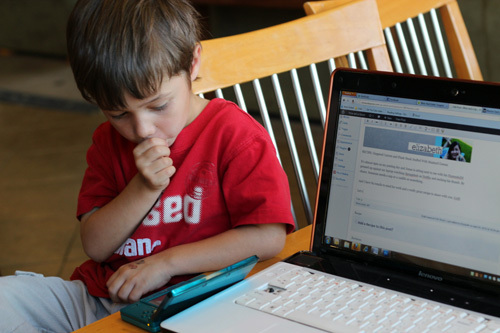 It’s almost 6pm on my posting day and Jonas is sitting next to me with his NintendoDS pressed up against my laptop watching Spongebob on Netflix and sucking his thumb. By choice. Someone needs a nap or a cuddle or something. And I have 84 emails to send for work and a really great recipe to share with you. GAH. Let’s dispense with the small talk and get right to it, shall we? 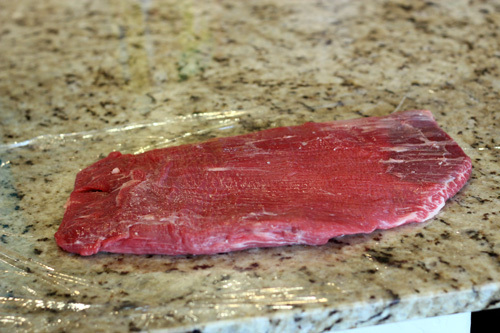 This recipe looked a little weird to me when I saw it in Everyday Food Magazine, but I had bought a flank steak on sale the day before, so it seemed like fate. So I did. And it was FABULOUS. No, like really good. I wish I had it for tonight instead of the nothing I’ve been preparing for the last hour and a half, that Jason will be thrilled with when he gets home. Preheat the oven to 400 degrees and preheat grill. 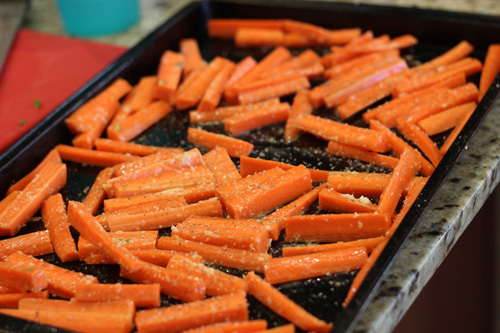 Spread carrots out on a cookie sheet. 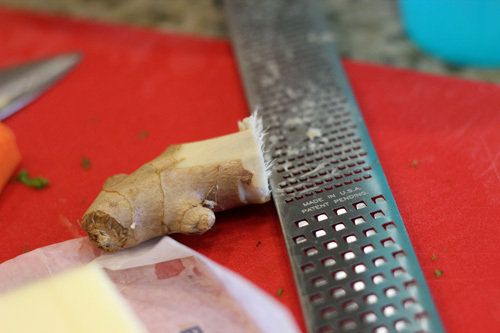 Top with grated ginger and melted butter and mix to coat. Finish off with kosher salt and pepper. Bake carrots for 35 mins. 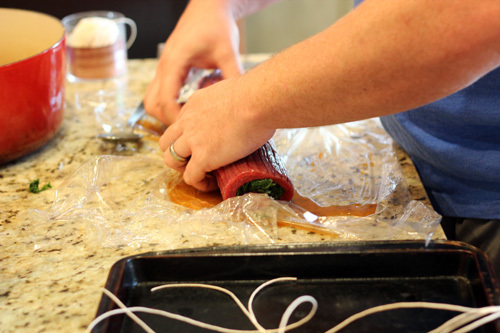 Place flank steak between two pieces of saranwrap. 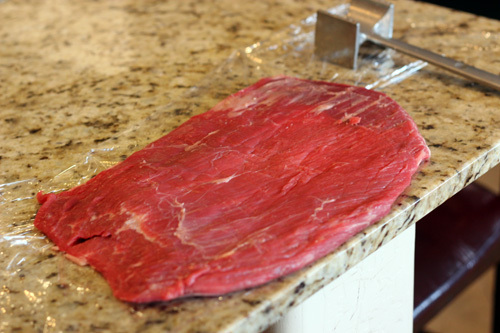 Pound with a meat mallet until 1/2 inch thick. 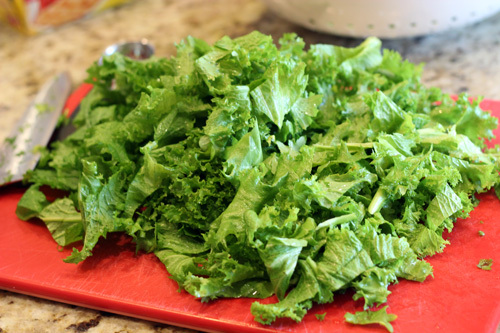 Remove stems and tough stalks from mustard greens and roughly chop. Heat 1 tablespoon of olive oil in a large pot on medium high. Add in garlic and cook 30 seconds. Add mustard greens to the pot and cook 5 mins. 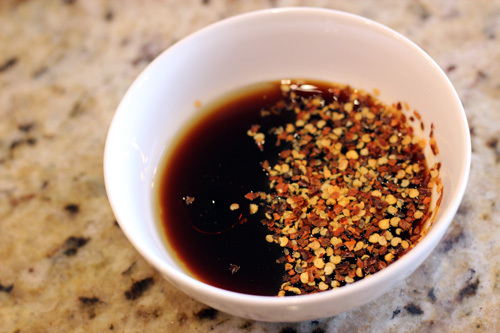 Stir in soy sauce, sesame oil and red pepper flakes and remove from heat. 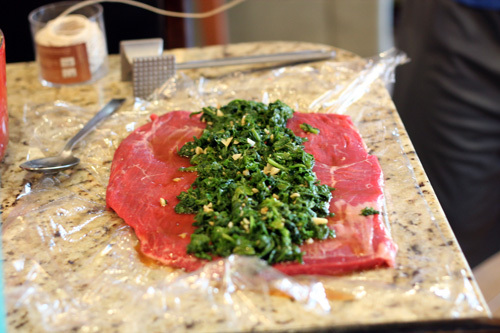 Spread mustard greens mixture on to flank steak, roll the flank steak up and tie it with kitchen twine. Grill the meat log on the grill for about 20 minutes, or until it’s evenly browned. 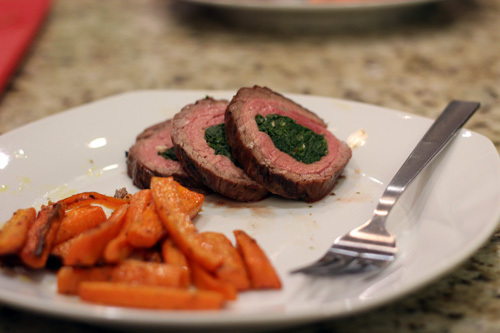 Slice the meat and serve with carrots on the side. 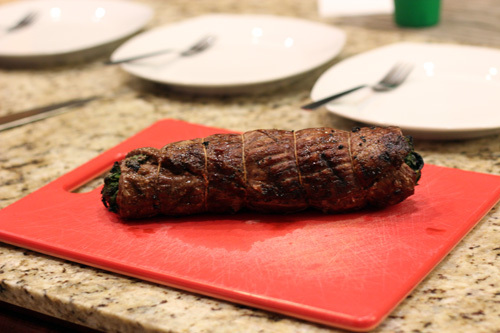 This entry was posted in 5 Wine Glasses, Beef, Dinner. Bookmark the permalink. One Response to Yum. Busy. The Use. gingered carrots sound amaze. Yum. And the presentation is gorgeous.